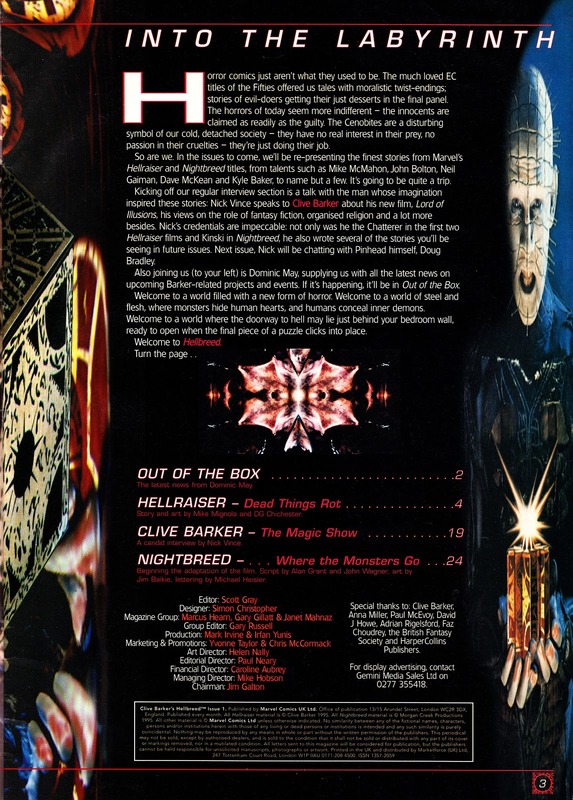 This is another long-forgotten (at least by me) MARVEL UK launch: the first issue of CLIVE BARKER'S HELLBREED from May 1995. The short-lived monthly, published under the ill-fated Marvel Magazine's imprint (which - briefly - housed DOCTOR WHO MAGAZINE and spin-offs, HAMMER HORROR and the PLAYBACK and BIZARRE one-shots), was mostly strip-based and reprinted Marvel US' licensed Barker adaptations (HELLRAISER and NIGHT BREED, hence the title) from the Epic line. Feature material (such as the Barker interview in issue one) filled-out the pages and helped to justify its 'magazine' designation. Details on-line are scant but it appears this ran for a mere three issues before being axed.